Bayside gives out turkeys and all the fixings to needy families at Thanksgiving. 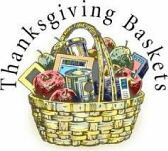 We need people to donate Thanksgiving food items; help sort food items; help fill Thanksgiving bags decorated by our preschool students (Saturday before Thanksgiving); and hand out bags to families who come to the Atrium for pick up (Sunday before Thanksgiving). For more information, contact Libby Graves, enybakken@cox.net.